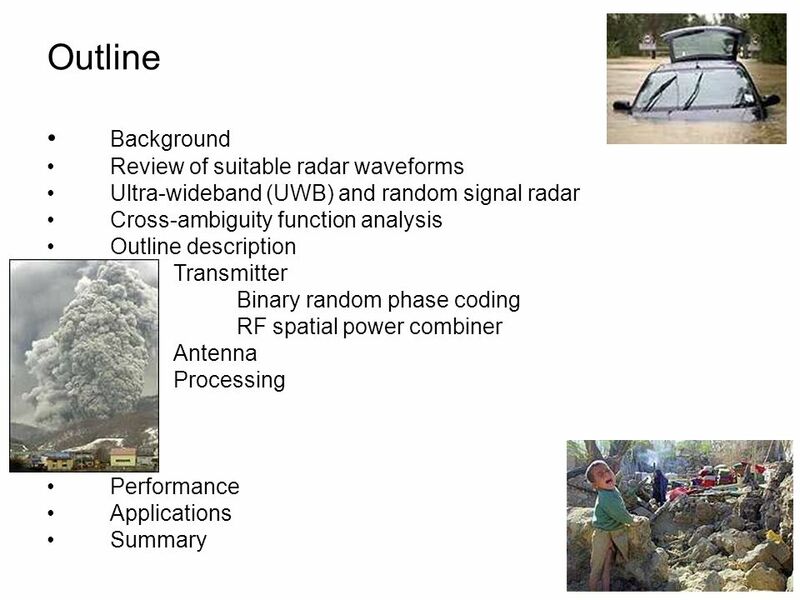 Ultra-wideband (UWB) and random signal radar Cross-ambiguity function analysis Outline description Transmitter Binary random phase coding RF spatial power combiner Antenna Processing Performance Applications Summary I am going to provide a introduce the talk with brief background to the radar. 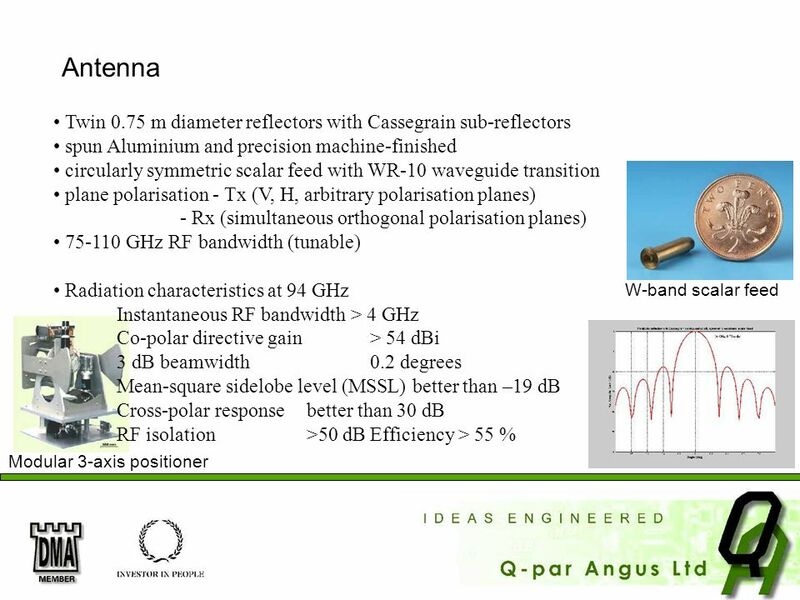 A review of suitable radar waveforms was undertaken that led into aspects of ultra-wideband and random signal radar. 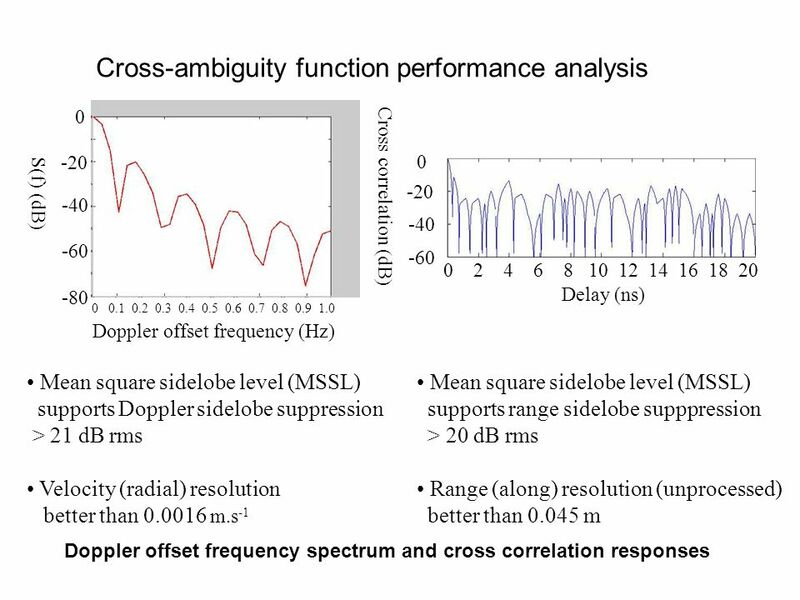 I will outline some of the characterteristics of the radar that was disclosed by a cross-ambiguity function analysis. I will then describe the radar in terms of basic transmitter, antenna and processing stages. 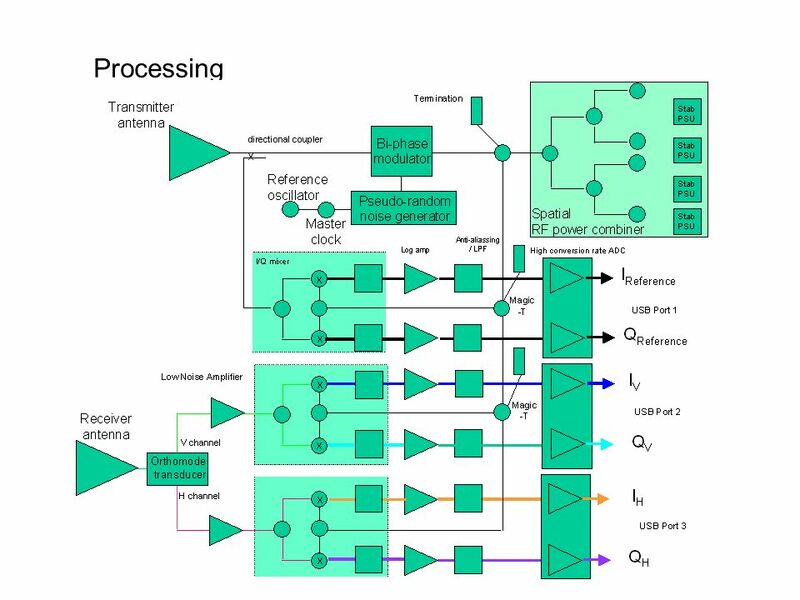 I will briefly mention the binary random phase coding that applied and the RF spatial power combiner stages before giving an indication of the performance and applications before concluding with a summary. Hopefully there should be time at the close for any questions. 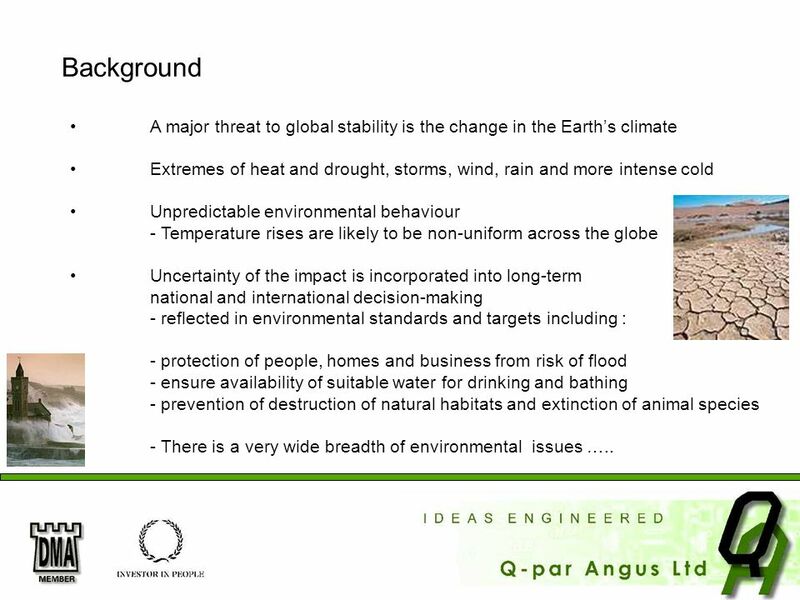 3 Background A major threat to global stability is the change in the Earth’s climate Extremes of heat and drought, storms, wind, rain and more intense cold Unpredictable environmental behaviour - Temperature rises are likely to be non-uniform across the globe Uncertainty of the impact is incorporated into long-term national and international decision-making - reflected in environmental standards and targets including : - protection of people, homes and business from risk of flood - ensure availability of suitable water for drinking and bathing - prevention of destruction of natural habitats and extinction of animal species - There is a very wide breadth of environmental issues ….. I begin by pointing out that a major threat to the stability of environment is the change in the Earth’s climate.This is manifested by more extremes in our weather. Extremities in temperature and water in terms of drought, storms, wind and floods. With such unpredictable environmental behaviour, temperature rises are likely to be non-uniform across the globe. The uncertainty of the impact is included into decision making at national and international levels. This is reflected in environmental standards and targets that include : protection measures in the event of flood, to ensure the availability of safe water and the prevention of destruction of natural habitats. I have only broached just a few amongst a very extensive breadth of environmental issues. 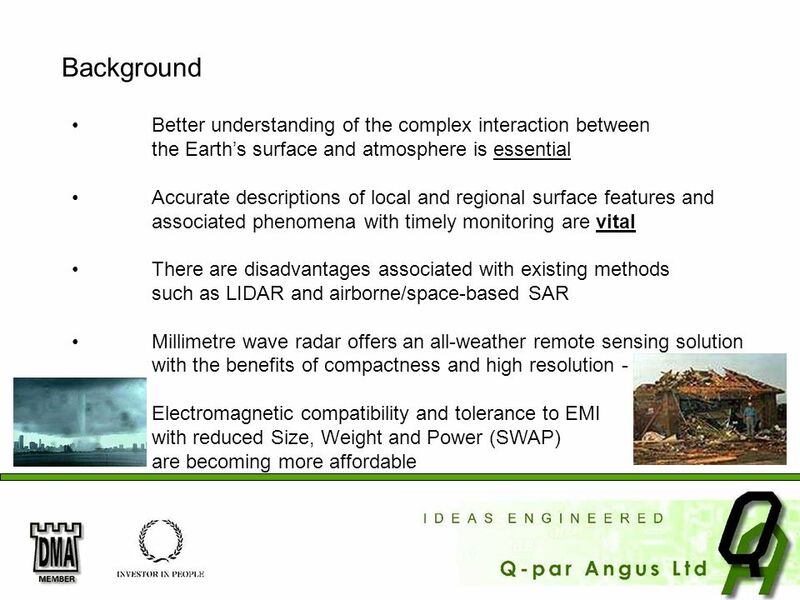 4 Background Better understanding of the complex interaction between the Earth’s surface and atmosphere is essential Accurate descriptions of local and regional surface features and associated phenomena with timely monitoring are vital There are disadvantages associated with existing methods such as LIDAR and airborne/space-based SAR Millimetre wave radar offers an all-weather remote sensing solution with the benefits of compactness and high resolution - Electromagnetic compatibility and tolerance to EMI with reduced Size, Weight and Power (SWAP) are becoming more affordable A better understanding of the processes and complex interaction between the Earth’s surface and atmosphere is essential if we are to help ameliorate the unwanted effects. Accurate descriptions of features and phenomena are vital together with timely monitoring by remote measurement. This is addressed by existing methods such as Laser Radar (LIDAR) and synthetic aperture radar from airborne and satellite-borne platforms. However. both LIDAR and SAR have shortcomings. LIDAR does not offer all-weather performance and can have ineffective measurement performance in heavy rain, fog, low cloud, mist or even light drizzle. Performance is degraded at high Sun angles and LIDAR can suffer from extraneous reflections or glint. Furthermore, the operating costs can be quite prohibitive, in excess of £10,000 per hour. LIDAR has a lack of foliage penetration or FOPEN. SAR offers all-weather capability but has relatively high capital and operating costs. Furthermore, SAR is prone to distortions, obscuration and RF interference. The wide spectrum allocations at millimetre wavelengths support a high tolerance (if not immunity) to electromagnetic interference (EMI) and are compatible with other operators (EMC).Portability enables operation from beneath attenuating media such as foliage, vegetation and low cloud. There is the question of latency with data often not being processed where it is needed. Time dependent phenomena (such as waves with correlation times of less than a second) are not accurately resolved. There are further questions regarding availability and ownership of data. Millimetre wave radar has the benefit of compactness. This imparts the ability to form very narrow beams so as to resolve small objects with a lightweight sensor that is capable of portable operation in tight spaces. The reduction in costs that is achieved by the use of COTS components ensures that this technology is becoming increasingly affordable. 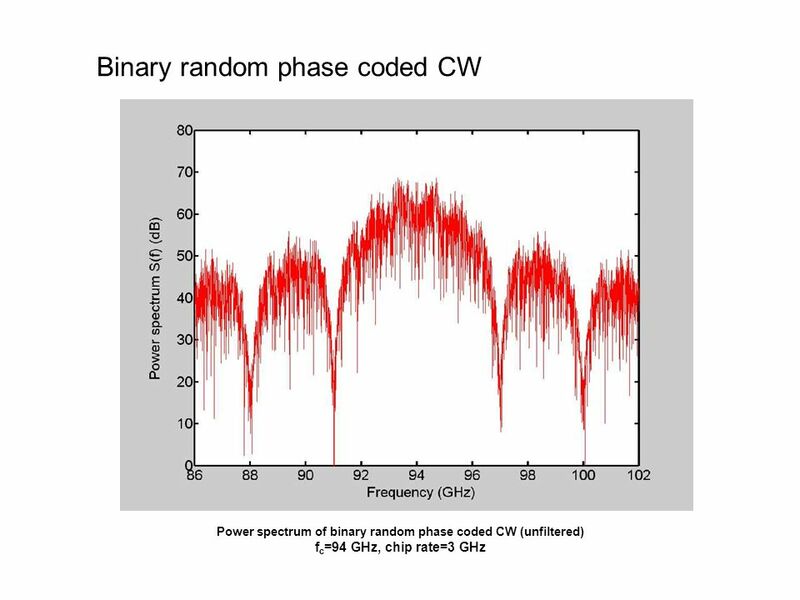 Uncoded CW Linear FMCW Pulse compression waveforms Phase shift / frequency shift coding Coherent pulse trains/pulsed Doppler Ultra wideband (UWB) and Random Signal Radar (RSR) Noise-like / chaotic waveforms Sine plus noise FMCW Noise FMCW Compound noise FMCW Dual-random quasi-CW Correlation RSR / spectrum analysis RSR / anti-correlation RSR random phase coded Random pulse radar Binary random phase coded A technical review of radar waveforms discounted the use of uncoded CW waveforms because of their inability to measure target range. Linear FMCW has strong coupling of range and velocity and it is difficult to synthesise ultra- wide band FMCW waveforms. Pulsed Doppler waveforms can be used to measure range and velocity simultaneously over a limited unambiguous range and Doppler offset frequencies. The pulse repetition rate can be contrived to match the range and radial velocities of expected targets. However, pulsed waveforms are peak RF power limited and suitable RF sources become increasingly unaffordable at shorter millimetre wavelengths. 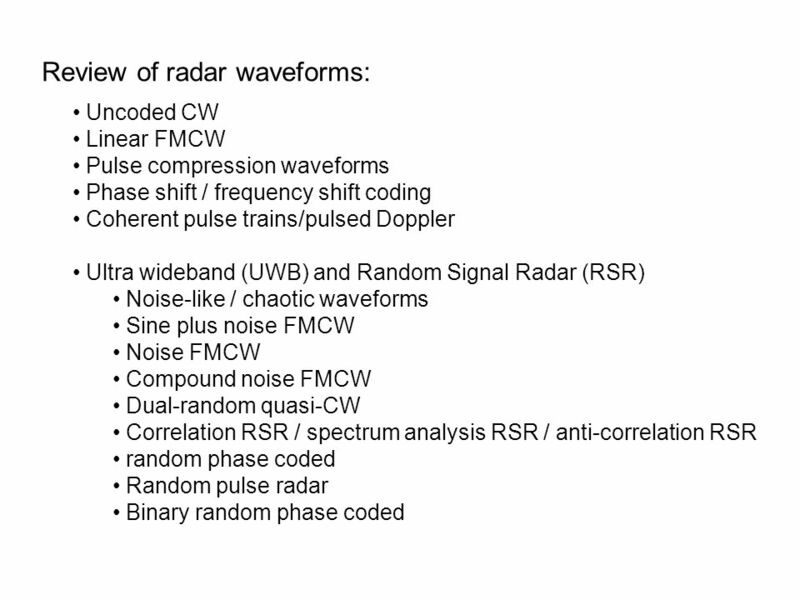 The term random signal radar (RSR) refers to radars whose transmitted waveform is random or random-like in contrast to conventional CW, pulse, FM or FMCW radars. 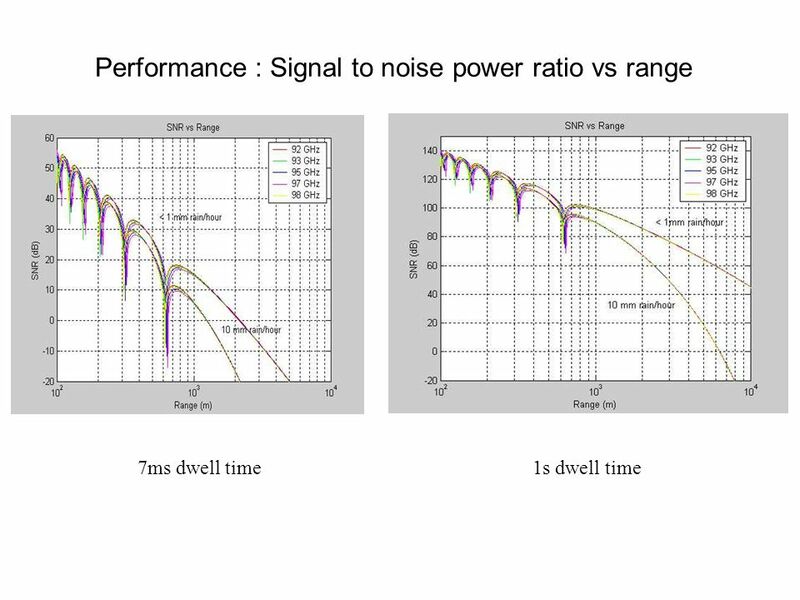 Several kinds of RSR have been implemented including noise FMCW, compound noise FMCW, dual-random quasi-CW, random phase coding and binary random phase coding. RSR waveforms have excellent EMI/EMC capability. 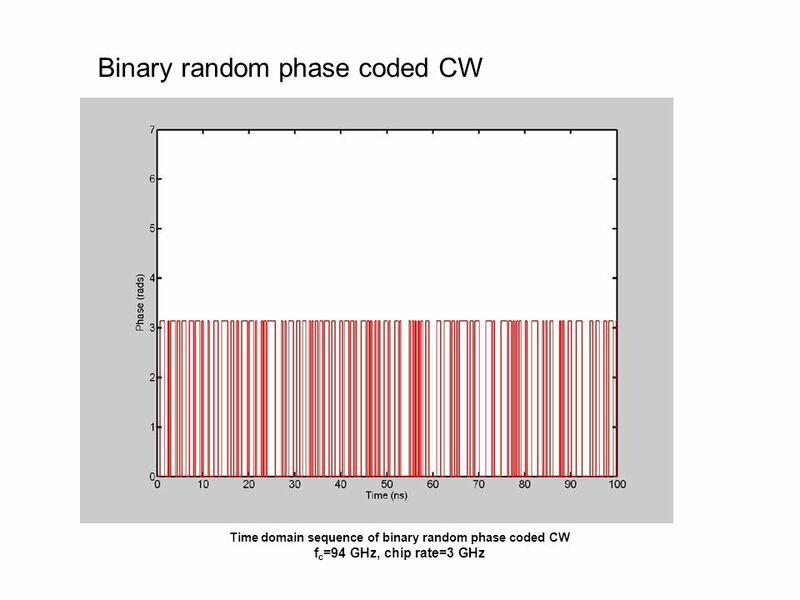 For the purpose of this paper, I am going to concentrate upon a class of RSR waveforms known as binary random phase coded waveforms. For a complex signal, where is the complex envelope The cross-ambiguity function is defined as where Sorry for the mathematics so late in the day but it is essential and it can be taken away and digested at your leisure. The signal filtering and processing that is incorporated in a radar receiver is normally a very close approximation to that required to perform matched filtering of the received waveforms from targets and unwanted clutter. 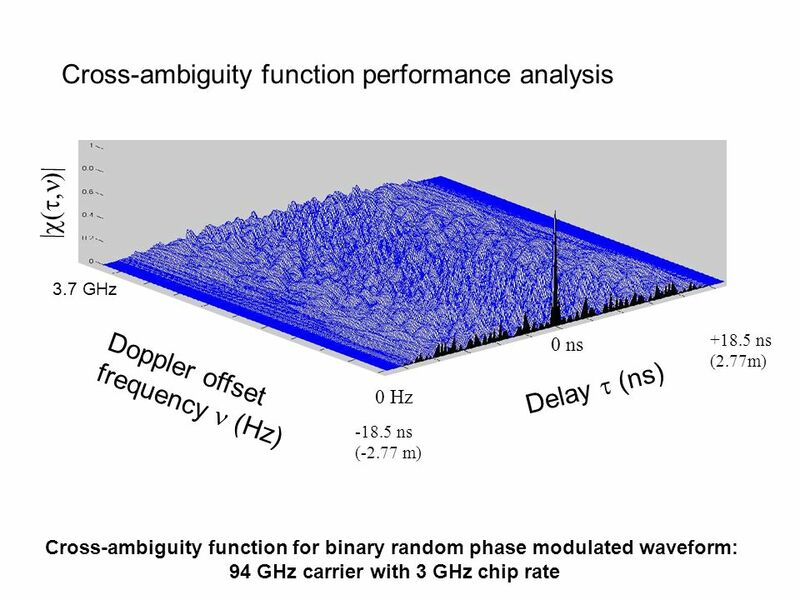 The ambiguity function is an established tool based on the assumed use of matched filter reception. It is normally used to make an assessment of radar system performance, although for more accurate subsequent analysis a cross- ambiguity function should be used. 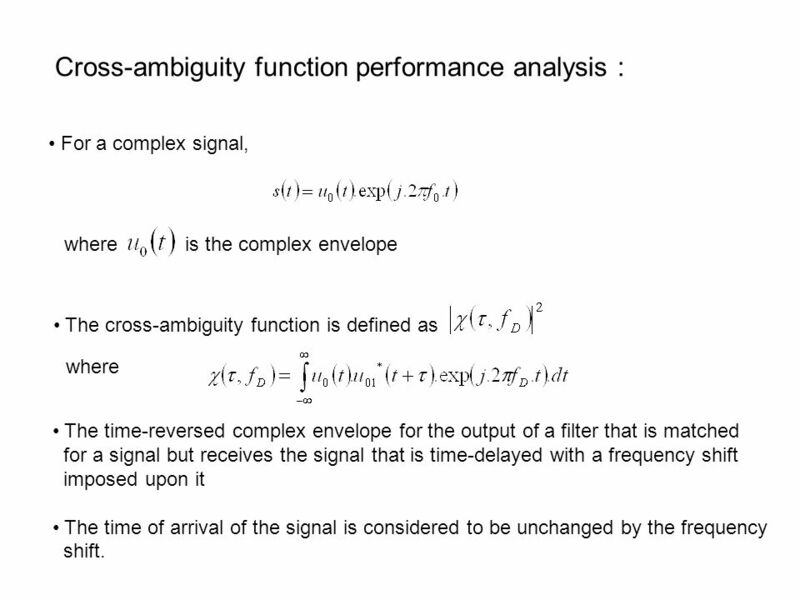 Basically, the cross-ambiguity function is the time-reversed complex envelope for the output of a filter that is matched for a signal but receives a signal with a frequency shift imposed upon it. The time of the arrival of the signal is considered to be unchanged by the frequency shift. The magnitude of the function at any point in the plane is a direct indication of the interference that will be encountered at the peak output time for the desired signal when a signal of the same magnitude but with offset and relative time delay is also received. Hence, the ambiguity surface reveals the degree of sensitivity that the radar processor has to signals arriving with different delays and frequency offsets, and of course these signals can be attributed to targets and clutter with different ranges and velocities. The trick of waveform design is to tailor a waveform that not only matches the desired target response but also maximises the statistical distance to unwanted responses. This optimal cross-ambiguity response often resembles a “thumbtack” in shape. The time-reversed complex envelope for the output of a filter that is matched for a signal but receives the signal that is time-delayed with a frequency shift imposed upon it The time of arrival of the signal is considered to be unchanged by the frequency shift. 14 Processing The radar is comprised of four main stages: Antenna, transceiver, controller and display. 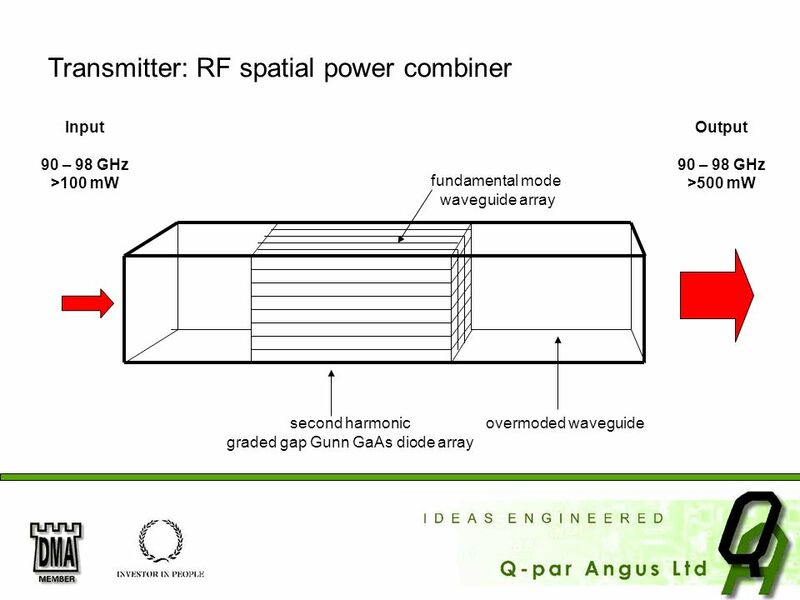 The spatial RF power combiner produces a coherent CW source in excess of 0.5w. 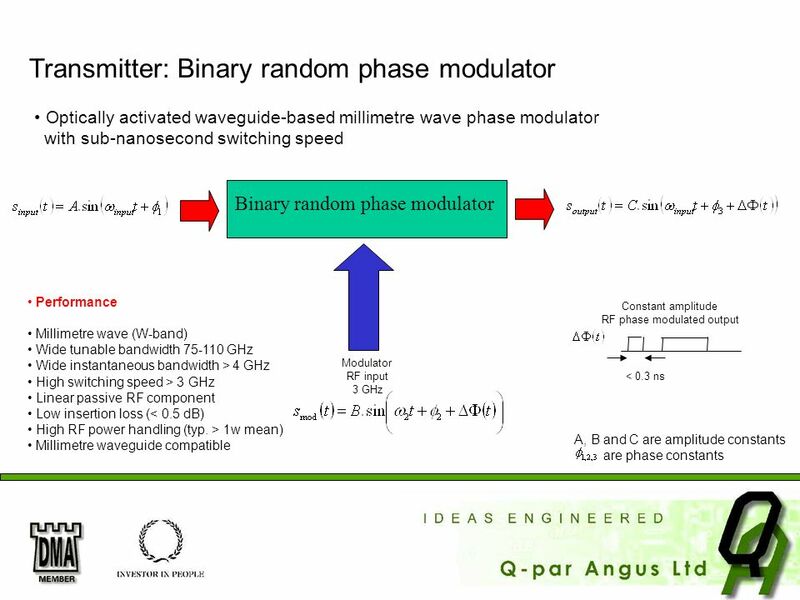 Binary phase coding is imposed by the bi-phase modulator at a rate of 3 GHz and then fed into the transmitter antenna. The received signals are cross-correlated with a delayed replica of the transmitted signal contained within a reference channel to implement complex matched filtering. The amplitude, phase and Doppler offset frequency are measured between complex received signals in both vertical and horizontal polarisation channels and a reference channel. The phase difference between multiple transmitted signals is measured to determine the slant range of the scattering object. Integration of a large number of signals provides sufficient energy for reliable target detection and high resolution imaging. Surface mapping of local land and water levels - observation and measurement of surface and near-surface water movements - measured water ripples can be resolved to infer flow rates, rates of change, flow direction and location of below-surface features Management of water resources drainage and irrigation planning Flood defence planning - Definition of flood plane areas - Monitoring 24 hour / 7 day with automatic triggering upon user-specified events to provide warning of flood escalation - Effective and timely deployment of limited and valuable defences/barriers - Planning, design and effective deployment of flood defence resources and structures such as bridge constructions, sandbags etc The primary application of this radar is the observation of surface and near- surface movements of water. The radar maps the physical interface between land and water surfaces with timely and remote measurement of the magnitude and direction of flow, with rates of change. These can be accurately measured and resolved with an all-weather capability to provide a low cost monitoring system. Data can be overlaid upon physical topological and terrain maps. The characteristics of measured water ripples can be used to infer below-surface features. Conventional microwave radar has only offered rather coarse resolution that is inadequate to enable this phenomena to be exploited. 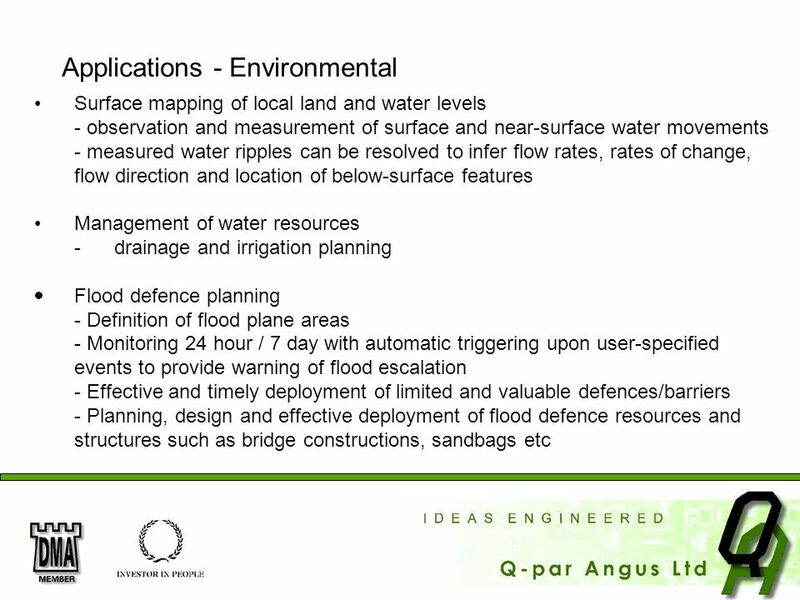 This capability has potential applications in a wide variety of environmental applications such as management of water resources and flood defence planning. 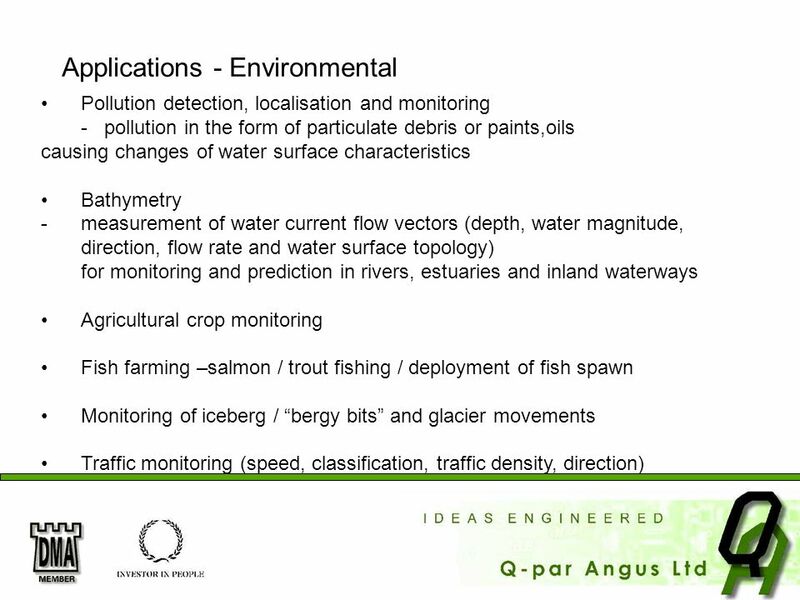 Pollution detection, localisation and monitoring - pollution in the form of particulate debris or paints,oils causing changes of water surface characteristics Bathymetry - measurement of water current flow vectors (depth, water magnitude, direction, flow rate and water surface topology) for monitoring and prediction in rivers, estuaries and inland waterways Agricultural crop monitoring Fish farming –salmon / trout fishing / deployment of fish spawn Monitoring of iceberg / “bergy bits” and glacier movements Traffic monitoring (speed, classification, traffic density, direction) Further environmental applications include pollution detection, bathymetry, agricultural crop monitoring, fish farming, monitoring of iceberg, “bergy bits”, glacier movements and traffic monitoring. 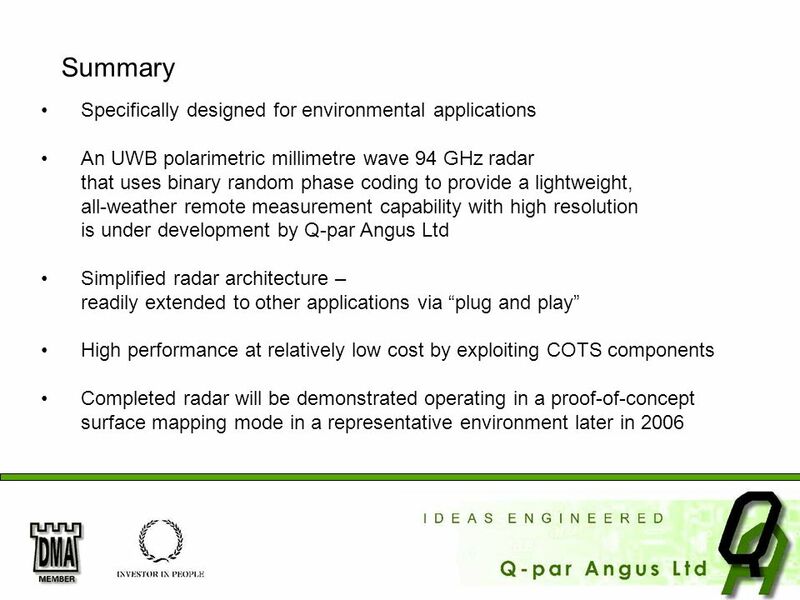 An UWB polarimetric millimetre wave 94 GHz radar that uses binary random phase coding to provide a lightweight, all-weather remote measurement capability with high resolution is under development by Q-par Angus Ltd Simplified radar architecture – readily extended to other applications via “plug and play” High performance at relatively low cost by exploiting COTS components Completed radar will be demonstrated operating in a proof-of-concept surface mapping mode in a representative environment later in 2006 In summary, this radar has been designed specifically for environmental applications. In particular, surface mapping with high resolution from surface sites. The radar is an UWB, polarimetric millimetric sensor that uses binary random phase coding to offer a lightweight, all-weather remote measurement capability with high resolution. 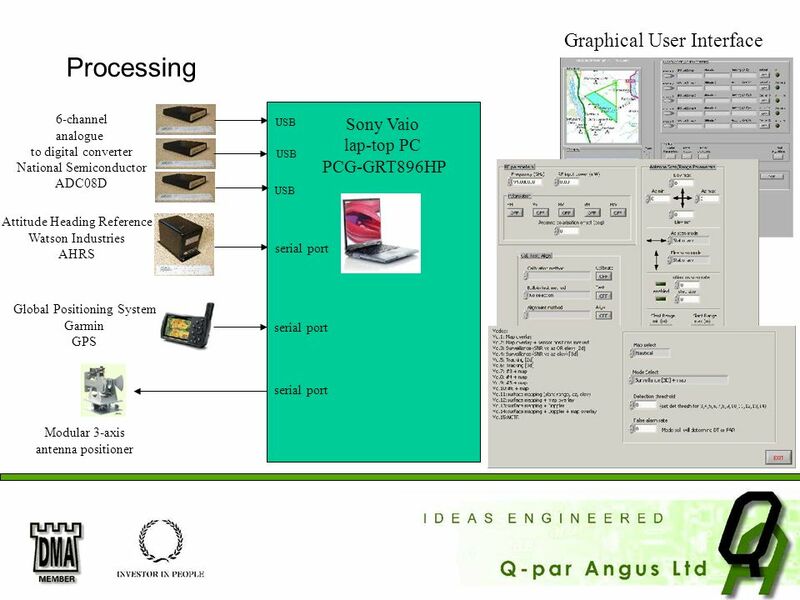 The radar has a simplified architecture that can be readily extended to other applications via “plug and play”. We believe the radar offers high performance at relatively low cost by exploitation of COTS components. The radar will be demonstrated as a proof-of-concept in a surface mapping mode in a representative environment later in 2006. UK Natural Environment Research Council University of Worcester Dr John Fagg (Head of Dept. 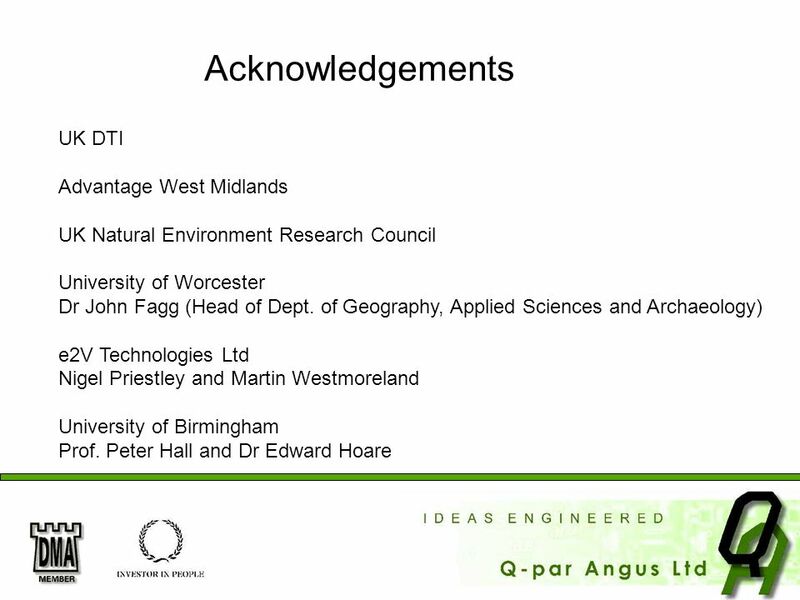 of Geography, Applied Sciences and Archaeology) e2V Technologies Ltd Nigel Priestley and Martin Westmoreland University of Birmingham Prof. Peter Hall and Dr Edward Hoare We would like to acknowledge the financial support of UK DTI, Advantage West Midlands and the Natural Environment Research Council. The help and support of our numerous friends and colleagues throughout UK academia and industry is also acknowledged. 21 Thank you Any questions ? Thank you. Any questions ? 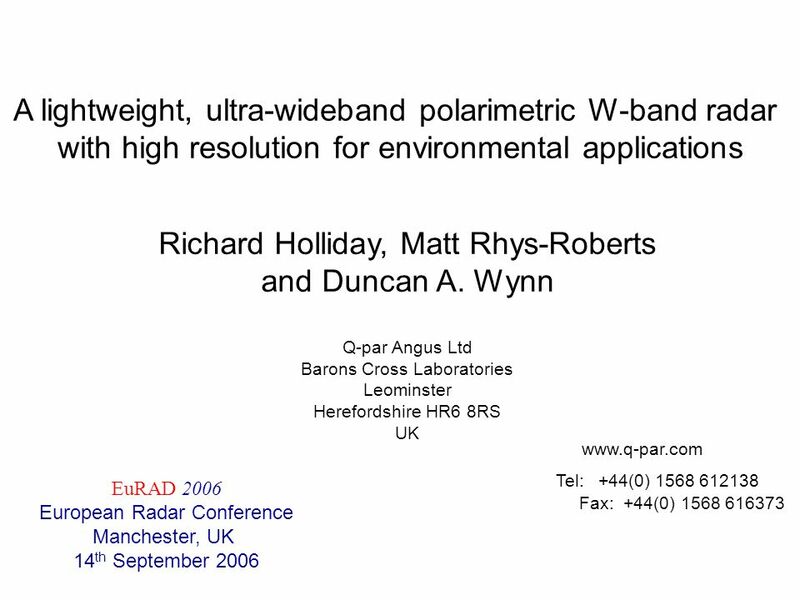 Download ppt "A lightweight, ultra-wideband polarimetric W-band radar"
Christopher O. Tiemann Michael B. Porter Science Applications International Corporation John A. Hildebrand Scripps Institution of Oceanography Automated. 1 Ground Based Meteorological Radars Presented By: David Franc NOAAs National Weather Service September 2005. 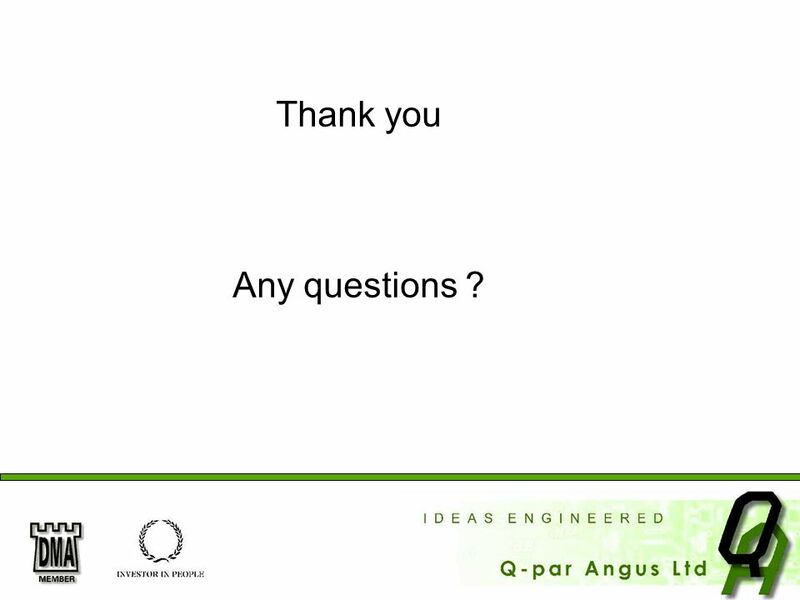 Semiconductor Optical Amplifiers in Avionics C Michie, W Johnstone, I Andonovic, E Murphy, H White, A Kelly. OUTLINE Motivation Modeling Simulation Experiments Conclusions. December 2002 Generation and Conditioning of Multitone Test Signals. UWB Channels – Capacity and Signaling Department 1, Cluster 4 Meeting Vienna, 1 April 2005 Erdal Arıkan Bilkent University. Yoshiyuki FUJINO National Institute of Information and Communications Technology, Japan Wireless Power Transmission Activity in NICT. 1 LOA-ENSTA. 2 3 For PW class laser, a contrast better than is required I ASE has to be < W/cm² The ASE intensity is enough to generate. ST/SEU-CO | | © Robert Bosch GmbH reserves all rights even in the event of industrial property rights. We reserve all rights of disposal such as copying. Mobile Communications Systems Janaka Harambearachchi.